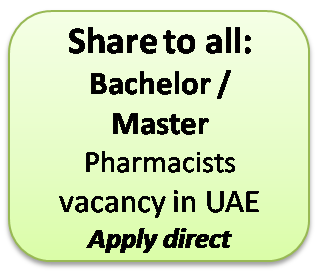 Bachelor or Master Pharmacists with three to five years experience required for this vacancy for Assistant Pharmacist that is found in Thumbay Pharmacy, a part of one of the world renowned group in health care, Thumbay group. They are servicing in Gulf Medical University hospitals also. 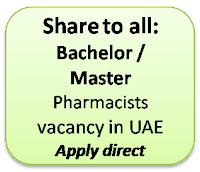 Please find here the source to submit the CV for the job of assistant pharmacist. The Job Description states that the ideal candidate should be B Pharm / Mpharm with minimum 3- 5 years of relevant experience. So, please contact them by submitting your CV at the earliest.